I adore camping! There’s no plumbing, nowhere to go if it rains, you’re tired of trail mix, it happens really far away from my couch, there’s no plumbing, and it’s not even the zombie apocalypse. Wait, why would I agree to go camping, again? I have a perfectly good house, after all. Yet I'll sit in the forest, where the wi-fi is spotty at best, unwashed and uncomfortable, without getting any sleep because the kids keep knocking on my tent flap whining that they heard yet another “ax murderer” in the woods. Holy… what if it WAS an ax murderer this time? Okay, maybe I don't adore camping quite as much as I thought. Next time, the kids are camping in the back yard! 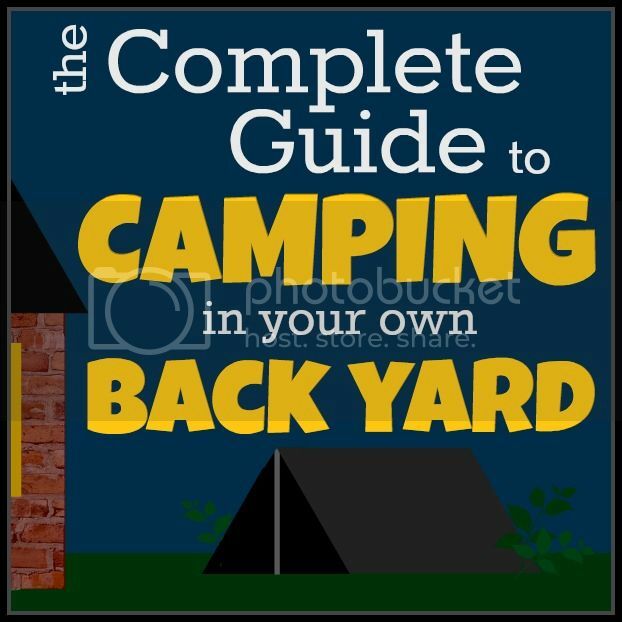 Click through to see how you can make their backyard camping experience, from food to games to the blessings of convenient toilets, even better than the real thing. Here’s a hint: almost anything is better than the real thing. My sincere apologies to anyone who tried that link ^^^ and found it went nowhere! Home Made Simple originally published the article, but then they merged with P&G Everyday and apparently didn't migrate the story to the new site. Luckily I had it saved on my trusty 'puter, so I've cut and pasted it here. Enjoy, and happy camping! Backyard camping is an easy, inexpensive way to have fun and enjoy the outdoors as a family, and it's a unique birthday party or sleepover idea, too. Start well before dark, and there are countless ways to keep everyone entertained! Whether you just want a few hours of recreation or you plan to sleep under the stars, here are some ideas to make your experience even more memorable. A tent. Of course this is optional, especially if you'll be heading indoors before bedtime, but having an outdoor shelter of any kind is exciting for kids. Consider stretching a sheet or blanket between two trees, draping one over a clothesline, or otherwise giving little adventurers a cozy place to call their outdoor home. Sleeping bags and pillows. The kids will appreciate having these, even if they're just used as a comfy spot to curl up with a book or look at the clouds. Insect repellent. Pesky bugs can put a damper on the fun, so be sure to keep them away. If you worry about the chemicals sometimes found in sprays, try citronella candles or make your own herbal repellent by mixing 1 part eucalyptus oil to 15 parts cooking oil in a clean spray bottle. Use aloe vera gel instead of the cooking oil to make a nice lotion. Flash lights or glow sticks if you'll be out after dark. Emergency gear. It's always a good idea to have a small first aid kit on hand, but also remember to bring special items, such as inhalers or an EpiPen if appropriate, in case of emergency or allergic reactions. Snacks. Chips or crackers are always popular with kids, and as a bonus you don't have to worry about vacuuming up crumbs! S'mores or hot dogs. If you have a fire pit, you'll definitely want to enjoy these traditional camping treats. Bugs On A Log. Spread some peanut butter "mud" on a graham cracker or pretzel rod "log" and dot it with raisin "bugs." None of the ingredients need to be refrigerated, it's healthy, and it's certainly an appropriate recipe for camping! Water bottles. With all the exercise and sunshine, don't forget to stay hydrated. Explore. Reacquaint yourselves with the often overlooked details around your yard. A few simple items like a magnifying glass, net and binoculars instantly transform kids into explorers. Khaki vests and hats really make them look the part. Nature Bingo. Create bingo cards, with each square featuring a different picture of common birds, insects, leaves and other natural elements found in your backyard. Players cross each thing off as they find it — the first one to complete a whole row or column wins! Go fishing. Even if you don't live near water, you can still go fishing with a little imagination. Tie one end of a string to a small magnet, and tie the other end to the tip of a stick to create a fishing pole. Glue magnets to paper fish and scatter them over the area you're pretending is water. Kids love to sit in a make-believe boat or dock and try to catch fish on their magnetic lines! Take pictures. It's fun to see things from kids' perspective, so give them an old camera or a disposable one and encourage them to click to their hearts' content. Hike. Whether your backyard is small or huge, you can create a hiking trail by placing signs with arrows on trees or other surfaces. Give your child a branch to use as a walking stick, and they'll feel like they're trekking across new territory. Board games. Even old games your kids seem to have lost interest in become appealing again when played in a unique environment like the yard. Archeological dig. Choose a spot where you don't mind digging in the dirt, such as the edge of a flower bed or an unused part of the garden. Bury treasures like quarters, small toys and cheap costume jewelry just below the surface, then let the kids discover them using hand-held gardening tools. Polish them up using water and an old toothbrush. Build a pretend campfire. If you don't have a fire pit or you aren't comfortable with kids playing near open flame, it's no problem! After the sun starts to set, place a flashlight on the ground so that the light shines straight up, or make a pile of several glow sticks. Cover it with crumpled red, orange and yellow tissue paper, then surround your glowing "fire" with logs or rocks to sit on. Sing. "Home On The Range," "If You're Happy And You Know It," and a few rounds of "Row, Row, Row Your Boat" are classic campfire songs. Tell stories. Spooky ghost stories are most commonly told on campsites at night, but younger audiences might prefer fairy tales or stories about themselves as babies. Telling a group tale, in which each person takes a turn adding a twist to the plot, usually ends with a lot of laughs. When camping in your own backyard, you don't have to go far or do a lot of planning to feel like you've been on an adventure. With these suggestions and a few materials you probably already have around the house, you can easily start creating lasting family memories this weekend! I guess I wasn't very specific, was I...? But seriously, if you're going to keep using our yard, try to keep in mind that a flower bed isn't the kind of bed you sleep in. The only kind of camping I do is back yard camping. Scratch that. I don't do that either. Why sleep on a rock when you have a bed 10 feet away? Your style is so unique compared to other people I've read stuff from. I appreciate you for posting when you've got the opportunity, Guess I'll just book mark this blog. I hear that! For some reason kids think that junk is the height of entertainment - I should've just piled rocks in their rooms instead of wasting money on beds. Those pesky backyard murderers ruin EVERYTHING. I have a sign with that sentiment posted on my fence so they know that their shenanigans are *not* appreciated at my house. For three consecutive years, we had a back yard campout birthday party for Twin B and 15 of his closest friends. This post brought back my ensuing nervous tic. But, hey...good for you guys! Uh oh, maybe one of the tips should've been to set a limit on the number of campers!